For gamers and puzzlers of a certain age, there are many fond memories of a certain historical journey that tested your wits, your luck, your tactical skills, and your endurance. I’m speaking, of course, of The Oregon Trail, a computer-game classic that not only taught millions of young minds about the perilous journey, but probably introduced most of them to the concept of death by dysentery. For those not in the know, The Oregon Trail was a computer game designed to explore 19th-century pioneer life on the long journey between Independence, Missouri, and Oregon’s Willamette Valley. 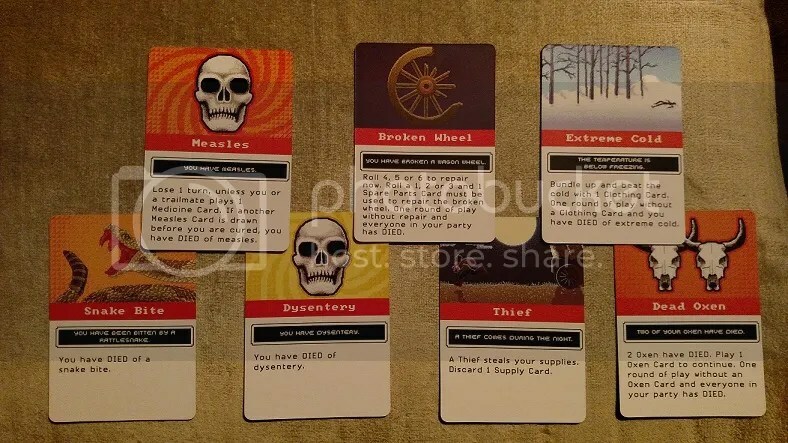 Players would manage food, supplies, and the pace of the trek in their covered wagon, occasionally dealing with dangers like disease, thieves, broken equipment, accidents, and treacherous rivers to cross. A classic in the eyes of many, this beloved game has made the jump from the digital realm to the analog one with a card-game variation released this year by Pressman Toys. Pressman Toys have outdone themselves with this nostalgia-fueled adaptation. 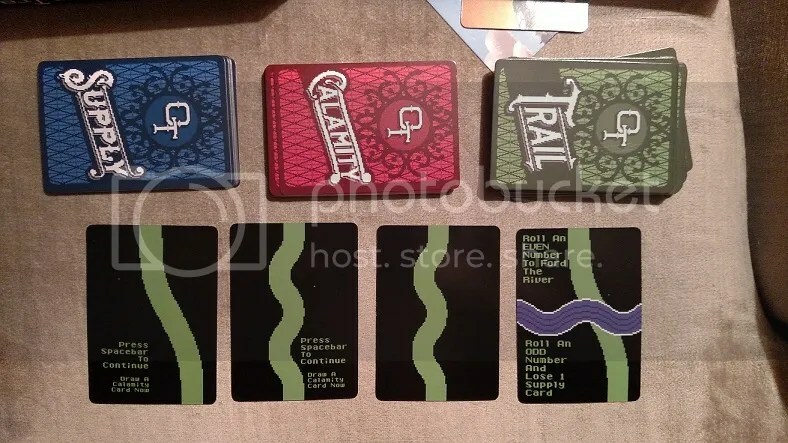 The trail cards themselves evoke the classic black-and-green screen of old-school computers, while the supply and calamity cards are pixelated in a style more akin to 8-bit video games. I daresay, though, that the card game is harder than the computer game. I don’t know that I’ve ever encountered a game that stacks the deck against the player quite so brutally. 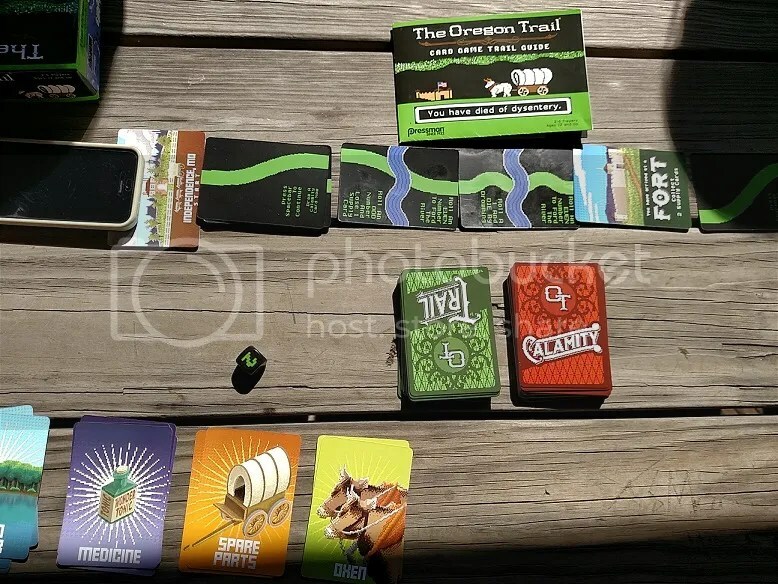 To make the journey to Oregon successfully, players must traverse 50 trail cards, avoiding illness and unpleasant twists of fate along the way (represented by the calamity cards that come up all too often), managing meager supplies, and testing their luck against river crossings (where a roll of the die determines your fate). This quickly becomes a strategic battle of resource management, trying to hold onto fort and town cards for as long as possible (since they provide some of the rare opportunities to gain new supplies), playing trail cards (which must link up in a continuous line), and deciding whether it’s better to spend medicine and clean water supplies on saving fellow players stricken by illness or letting players die and hoarding supplies for the survivors. I’ve played the game a few times now — each session has lasted about 30 minutes, with the team failing to reach Oregon both times (though we made it more than halfway on the second try) — and it remains an engaging, enjoyable play experience. Yes, it can be disheartening to see a player die early on (as I did by rattlesnake bite in my very first turn one game), but the group play experience — pitting all of you against the game itself — is only enhanced by the difficulty. There are some aspects of the computer game — hunting, for instance — missing from the card-game experience, but I suspect the development of simple house rules (like spending a bullet card and letting a handful of dice rolls determine your success hunting, to more closely recreate the computer game’s hunting mechanic, for instance) would enrich the gameplay. Whether you’re a fan of the classic computer game or a newcomer to the franchise, I suspect The Oregon Trail will delight you (and challenge you!) like few card games ever have. 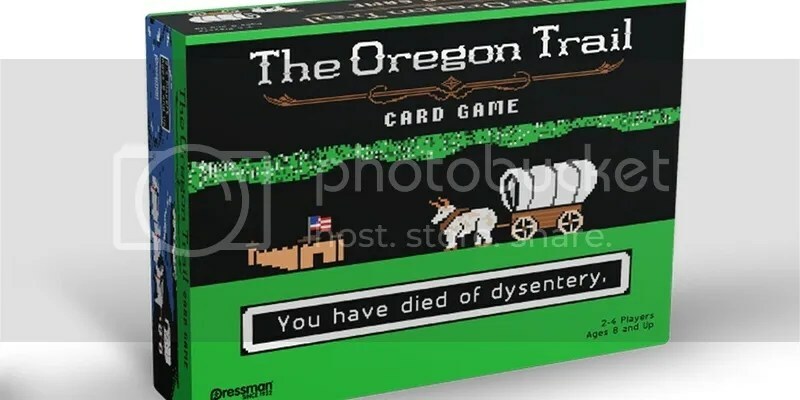 This entry was posted in Uncategorized and tagged card game, classic, computer game, dysentery, ford the river, game history, games, Geeking Out, History, independence, Oregon Trail, Oregon Trail Card Game, Pop culture, Pressman, Pressman Toys, product review, Puzzle history, PuzzleNation, Puzzlin' fool, The Oregon Trail, willamette valley by gmdirect. Bookmark the permalink.